← 2016 CGOA Conference Afterglow! I just love to crochet for babies, don’t you? I’m currently still crocheting (and knitting) for my granddaughter, who is already 3 months old! How can she already be 3 months old? How does that happen? It seems like yesterday that she was born!!! I’m almost done with a lacy dress for Rubekah that I’ll be taking with me on my next trip to China. And I finished a knit dress for her on Sunday by sewing on the buttons to finish it off. I’ll share photos of Ruru (that’s one of her nicknames) wearing these dresses as I get them from my son and daughter-in-law. Being a grandma is the best! Babies are so much fun to crochet for, especially since many of the projects for them are quick projects with almost instant gratification! But even crocheting baby blankets is gratifying and lots of fun, even if they take longer! I haven’t found a crochet baby project that I don’t enjoy! I’d like to share about a new book by Leisure Arts called “Nature’s Gifts for Baby”. 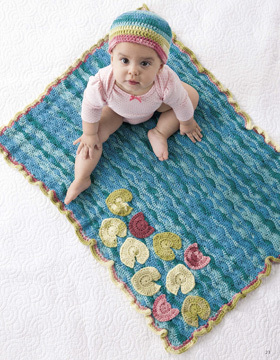 This book has 7 sets of designs for babies, designed by Sara Leighton. 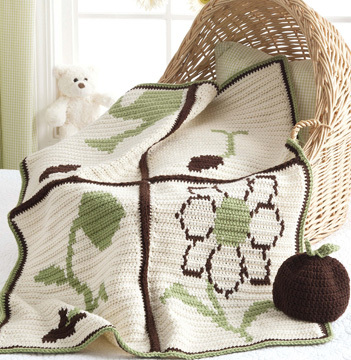 Each set includes a baby blanket and a hat. 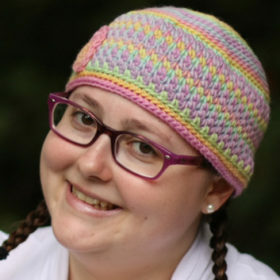 So if you’re in the mood for a quick project, why not crochet the hat? 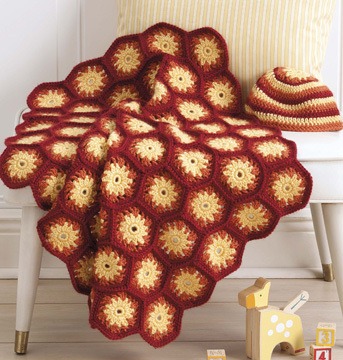 If you have more time and would like to crochet for longer, the blanket is perfect! 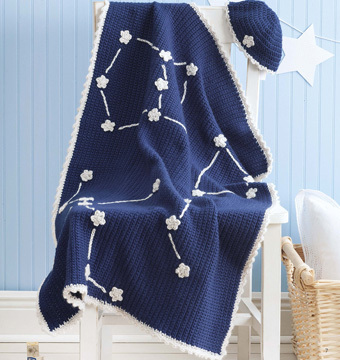 And if you like coordinating sets, make both the blanket and the hat! Each design reflects “gifts of Nature, such as a starry sky or lush flowers and trees”. I haven’t met Sara in person, yet, but she’s as sweet as can be online! I absolutely LOVE the hat she’s wearing in this photo, too (here’s a link to her pattern for the hat on Ravelry)! I think Sara is going to have a long, successful crochet career ahead of her! As you can see, each set is unique! 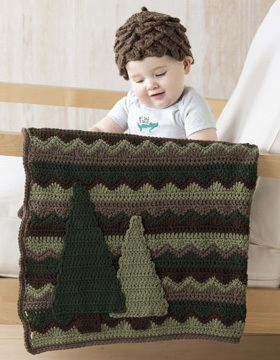 Each blanket is made with different stitches, mostly in “quick to crochet” rows. Each of the hat patterns come in 2 sizes: 0-6 months and 6-12 months. The exact yarns (and colors) used in each set are listed at the back of the book. One of the newer features of Leisure Arts books is additional videos for stitches and techniques, like how to work a treble crochet, how to change colors, and lots more. Their books also include many diagrams for different stitches and/or techniques. 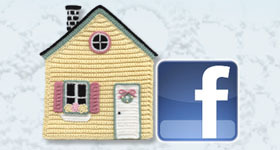 All of this extra information helps crocheters of all skill levels to be successful in their crochet projects! 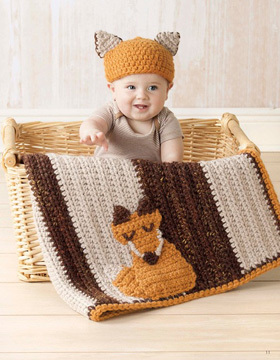 Each of the sets in this book, except the Fox Set, is made with medium, worsted weight yarn. The Fox Set is made with super bulky weight yarn. If you’re not familiar with yarn weights, check out this page on the Craft Yarn Council’s website here. The Craft Yarn Council has many pages of helpful information about crocheting, knitting, yarn, crochet hook sizes, knitting needle sizes, and more on their website. So if you’ve never gone to their website, you don’t know what you’re missing! You can see and purchase “Nature’s Gifts for Baby” on the Leisure Arts website here or on Amazon here. This 32-page book retails for $9.99. 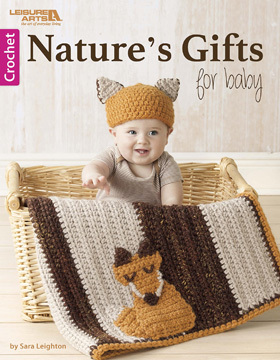 If you’re looking for some new crochet patterns to make for a favorite baby in your life, I hope you’ll consider this book with lots of creative designs! 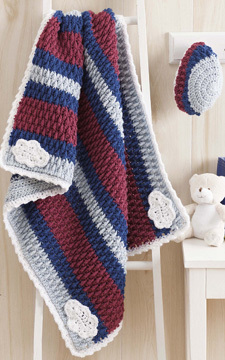 This entry was posted in Book review, Crochet designs, Crochet for baby, Crochet patterns, Crochet patterns for baby and tagged crochet book, crochet patterns. Bookmark the permalink.